The AM29DL322G AM29DL323G AM29DL324G consists of 32 megabit, 3.0 volt-only Flash memory devices, organized as 2,097,152 words of 16 bits each or 4,194,304 bytes of 8 bits each. Word mode data appears on DQ0DQ15; byte mode data appears on DQ7DQ0. The device is designed to be programmed in-system with the standard 3.0 volt VCC supply, and CAN also be programmed in standard EPROM programmers. 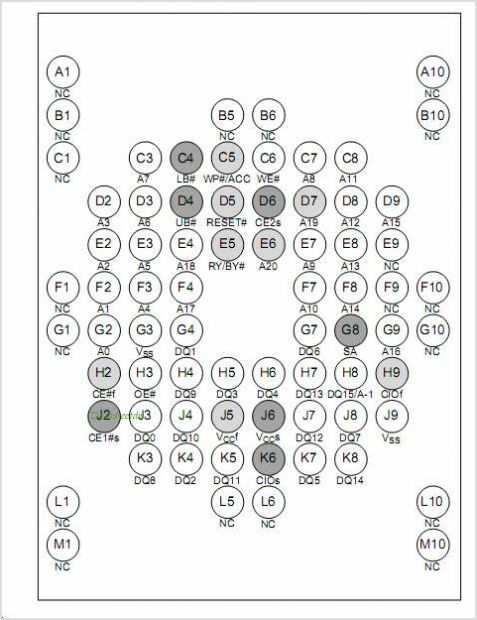 This is one package pinout of AM29DL322G,If you need more pinouts please download AM29DL322G's pdf datasheet. AM29DL322G circuits will be updated soon..., now you can download the pdf datasheet to check the circuits!